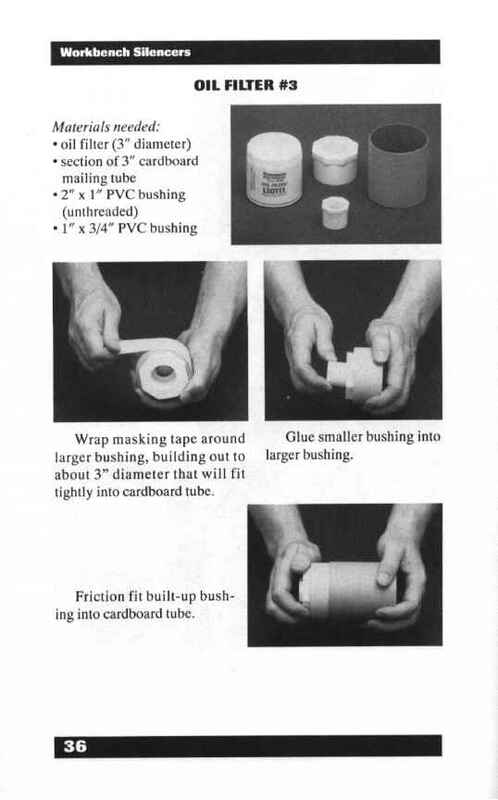 Insert bushing into basin Glue bushing/basin gas-gasket. ket assembly onto top of con nector. Fit adapter onto top of can, tighten band clamp, and install weapon. Fit adapter onto top of can. Tape second can onto first with metal repair tape. Bare cans can be used with little preparation. Rotate the pull tabs 180 degrees and pull straight up on them; they should pop right off. 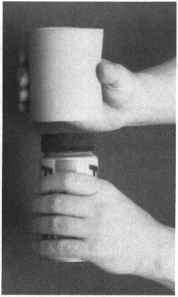 Then carefully insert the tip of your little finger into the can and push the flap back as far as it will go. Unless you're a real klutz, you ought to be able to do this without cutting yourself. A simple bare can can easily be bolstered from the outside with a drink koozie and a wipe. Use the top of the can to trace a circle on one of those oblong foam rubber wrist rests used with CRT keyboards. Cut it out with scissors. 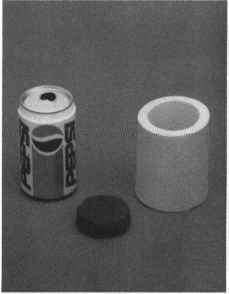 Turn the can upside down, place the disk on the bottom of the can, and push the koozie down over disk and can. 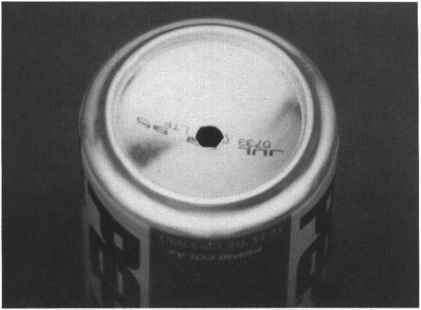 Another design involves removing the top of the can and augmenting it from the inside. Punch 1/4" hole in center of can bottom. Insert pointed end of dowel into hole in bottom of can. 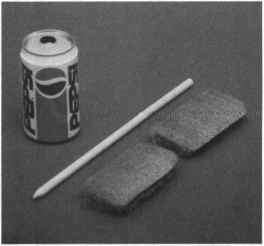 Keeping the dowel centered and fixed in this position, work steel wool into can. Then remove dowel; this will leave a channel in steel wool running length of can. Smaller V-8 cans can be packed with steel wool just like pop cans. Use only one steel wool pad per can. Bubblers are attached to garden hoses and used to irrigate shrubs. They have a plastic "pot scrubber" type element inside to diffuse water flow. 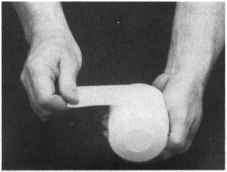 Cut or saw bubbler shell in two around seam. Remove and discard diffusing element. Drill 1/4"-3/8" hole in end of bubbler shell. Wet sponge, wring it out, Tape halves of shell back and fit it into bubbler shell. together. Oil filters consist of a perforated steel sleeve surrounded by a sound-dampening filler element enclosed in a steel shell. Why hasn't anyone thought of using one as a silencer before? The oil filters used with the adapters shown here have diameters of 3 3/4 inches and 3 inches. They have a second layer of sheet metal about 1/4 inch under their top ends, which makes a good double baffle for the bullet to pass through. Look inside the oil filters to make sure there are no brackets or fixtures at the top end that might interfere with the transit of the bullet. 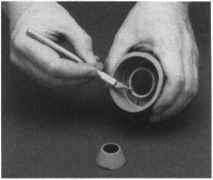 Glue smaller bushing into Insert bushing into coupling larger bushing. and tighten band clamp. 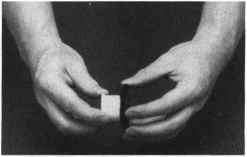 Make four slits in coupling as shown. 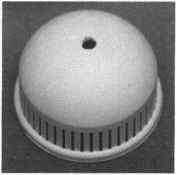 Cut hole in rubber cap as shown. Fit bushing into basin gasket. Fit adapter onto bottom of oil filter and install on weapon. Wrap oil filter with enough layers of tape to ensure tight fit in cardboard tube. Friction fit oil filter into cardboard tube. How to make an oil filter suppressor adapter? How to make oil filter gun silencer? Does steel wool work in a silencer? How make a homemade gun silencer oil filter? How to make ruger mark 3 silencers from pvc? How to home made gun silencer with oil filter? How to make baffles for suppressor 7.62mm? How to make improvised silencer vs tape? How to make a silencers for guns? How to make a silencer baffle out of pvc? How to make a oil filter silencers? How to install oil can as rifel suppressor? How to make a oil filter silencer adapter? How to build a oil filter gun suppressor adapter? How to make oil filter suppresser? How to design a pistol silencer? 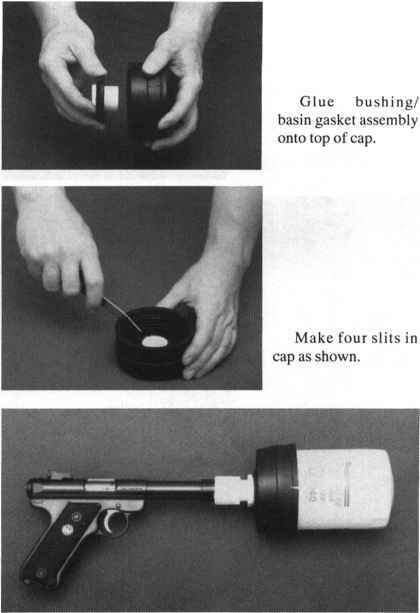 HOW TO MAKE A SHOT GUN SILENCER FROM A OIL FILTER? How to install oil filter silencer adapter? How to make a pistol suppressor connector? Which car oil filters make good weapons silencers? How to build oil filter silencer adapter? Does an oil filter suppressor work with a 9mm? What size oil filter works as a suppressor? How to make silencers for 22lr on oil filter? What type oil filter fits the silencer adapter? 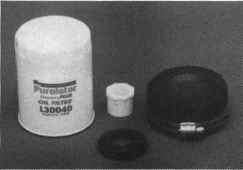 How to make a supresser from an oil filter? 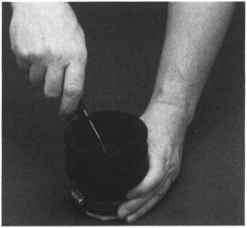 Does a oil filter make a good silancer? How to make an oil filter supressor? How to make a field expedient suppressor? How to installoil filter gun suppressors? How to mount an oil can suppressor? What is in a muzzle silencer for a gun? 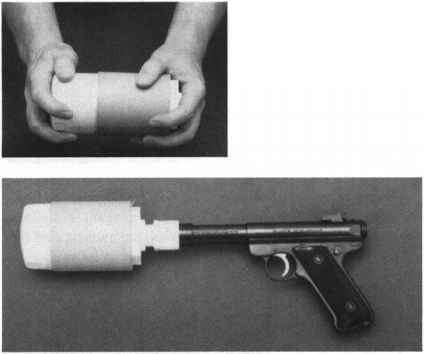 How to make home made silencer for 38 special? How to make a silencer for 38special? What happens when grease oil is applied outside layer of the silencer? What can be used as an improvised silencer gasket? How to find what size gun a suppressor fits? 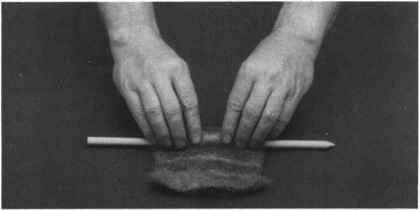 How do steel wool used in making gun suppressor? Do oil filter silencers work?